SAN DIEGO -- U.S. Customs and Border Protection agents at the California-Mexico border this weekend seized 277 pounds of narcotics with a value of more than $1.3 million and took into custody 14 fugitives, including one of the FBI's most wanted. Border agents seized more than 162 pounds of methamphetamine, 49 pounds of cocaine, 56 pounds of marijuana, seven pounds of heroin and 2,171 tablets of the prescription painkiller tramadol. 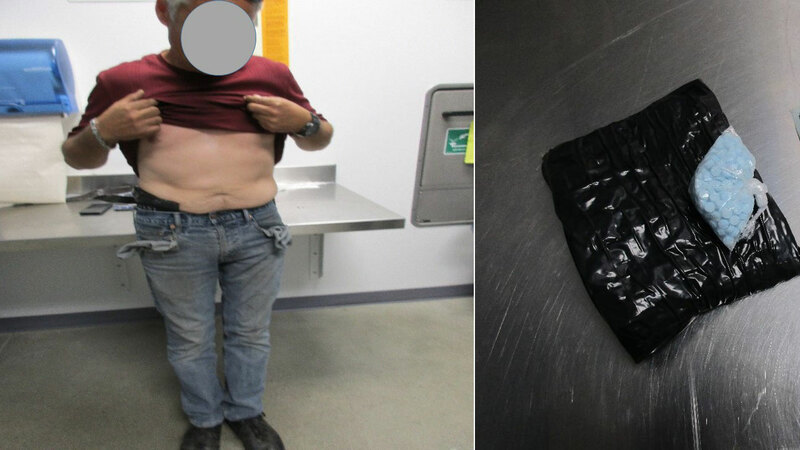 The tramadol was discovered with the help of a CBP canine, who alerted to a 50-year-old man Friday night as he was crossing the pedestrian facility at San Ysidro. Officers searched the man, a U.S. citizen, and allegedly found the tablets of tramadol concealed on his person, with a street value of $10,860. They also arrested or took custody of 14 fugitives who were facing charges that included lewd acts with a child, assault, homicide and conspiracy. One of those fugitives was on the FBI's top 10 most wanted list. Luis Macedo, 29, was turned over to CBP agents at the border by Mexican authorities Sunday night.